This is day 2 of my “Thanksgiving Revisited” series… a tad late but my airplane to New York didn’t have wifi, gasp, the outrage! I have a pumpkin fetish, I bought so many this year just to look at. And I like a good pumpkin dessert as much as the next girl. 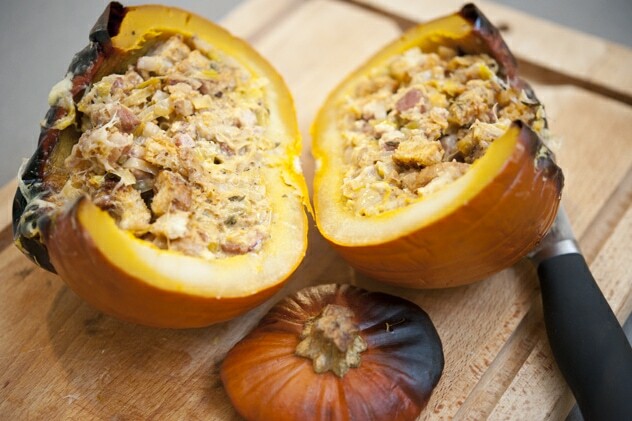 But I think we need more savory pumpkin dishes on the Thanksgiving dinner table. To show the pumpkin’s full glory and potential. Cream! Heavy cream! The best ingredient there ever was. Drizzle it with olive oil and wrap it in tin foil. If the cloves fall apart like mine did, that’s A-OK. Roast them in the oven for 1 hour while you get the rest of the ingredients together. 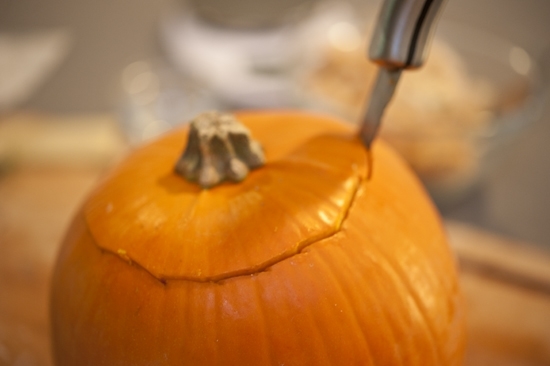 Carve the top off of the pumpkin. It will be full of pretty seeds. If you’re feeling patient you could save some of them and toast them. Or you can cut them off of the lid and cast them away. 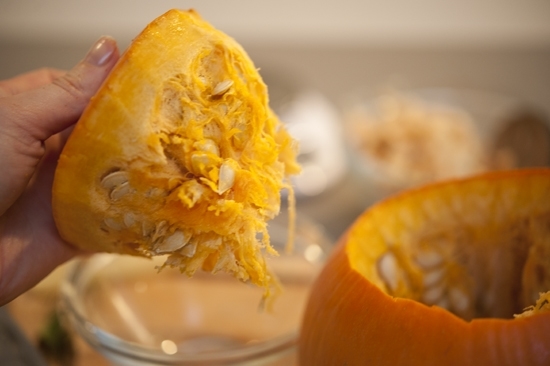 You’ll want to scoop all of the seeds out of the inside of the pumpkin too. 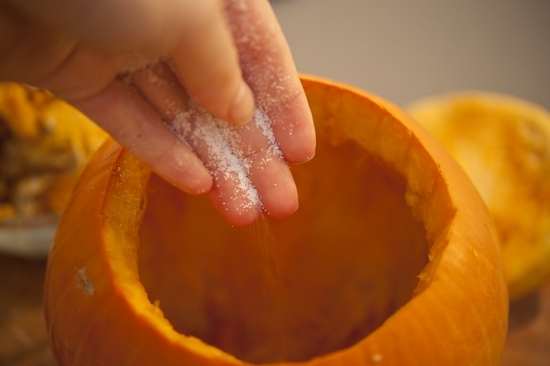 Then season it with a good dose of sea salt on the inside. And a few good turns of pepper. 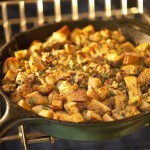 Then set it aside and get the stuffing ready. 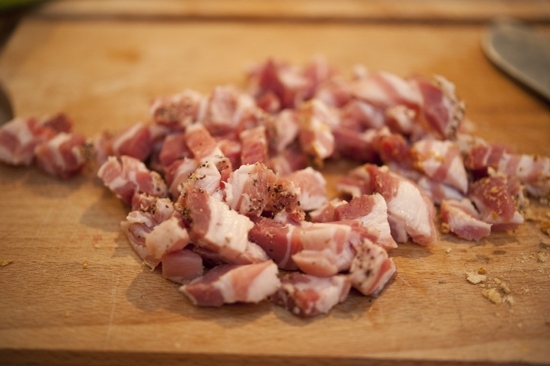 Cut the pancetta up into a small dice. Like so. 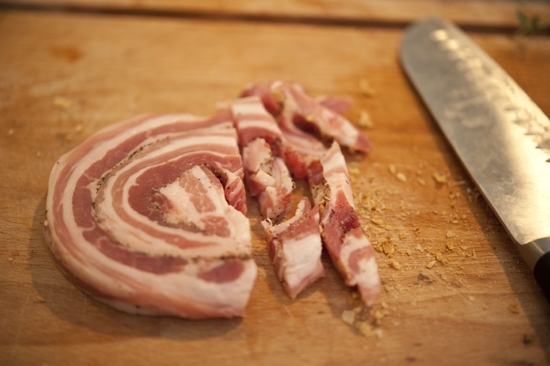 Isn’t pancetta pretty? I prefer it to bacon. True story. Basically you cut off the root, then make diagonal slices toward the green portion all around. So there is a bit of a point at one end. This is because there is a lot of white on the inside of the base where the green starts. I realize that made no sense but the idea is “food economy,” getting as much of the white as possible while eliminating the green. Save the green for stock! It is amazing. There is a lot of dirt that is buried where the green and white meet. 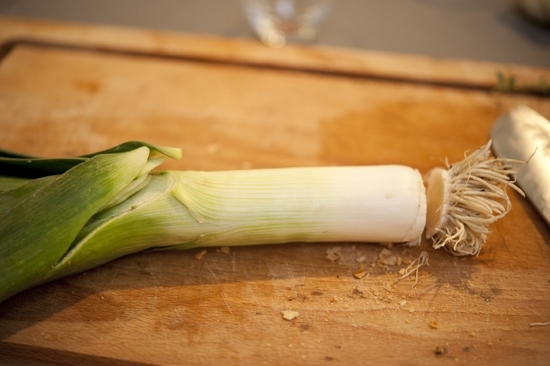 So slice your leek in half and run the two halves under water to get out all of the grit from between the layers. 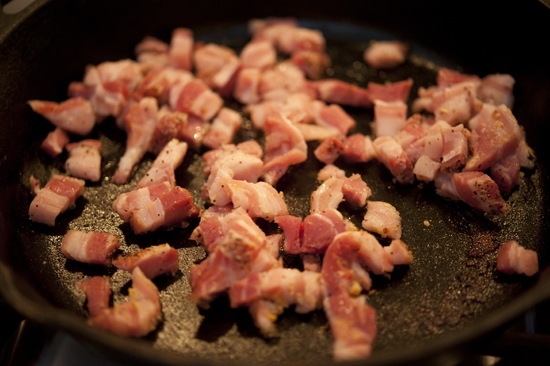 Next, render some pancetta in a skillet and let the fat sizzle and the pancetta crisp. 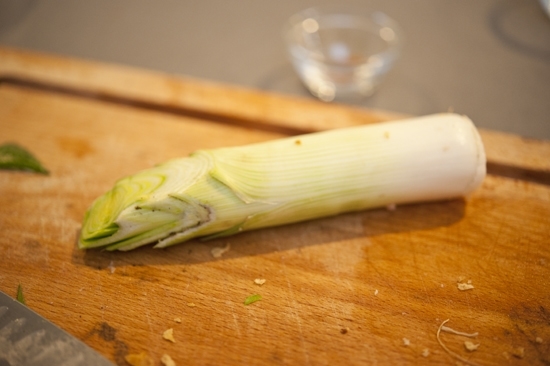 Add the leeks, season them with some salt and pepper and let them wilt. They’ll become soft and translucent. Try to resist eating the whole thing with a spoon right then and there. It’s hard, I know. Once you have it where you want it, remove it from the heat and let it cool. 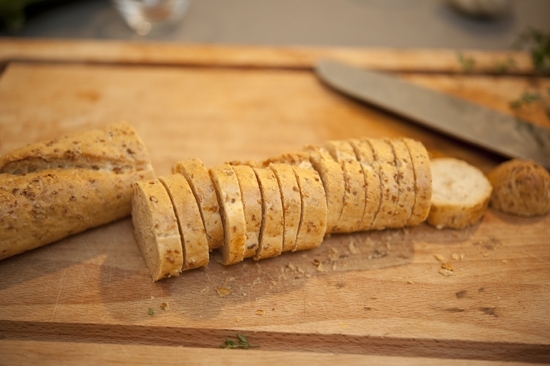 While that is going on, cut some stale bread… it can be semi-stale, it’s going to soak up some liquid. You’ll want 1/4-inch to 1/2-inch pieces. 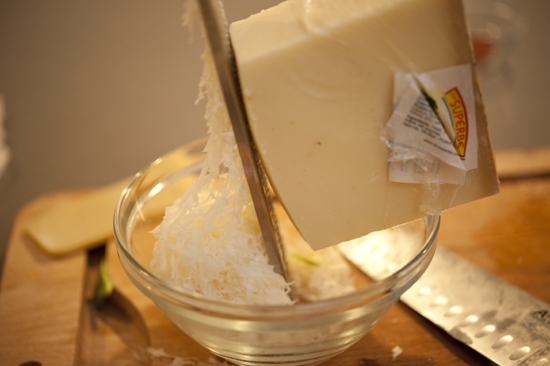 Then grate the heavenly gruyere. 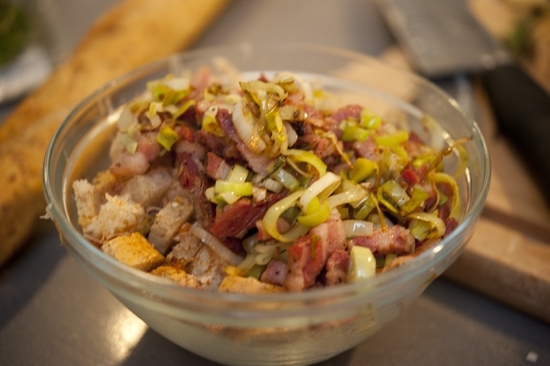 Add the pancetta and leek mixture to the bowl… and give it a a nice stir. 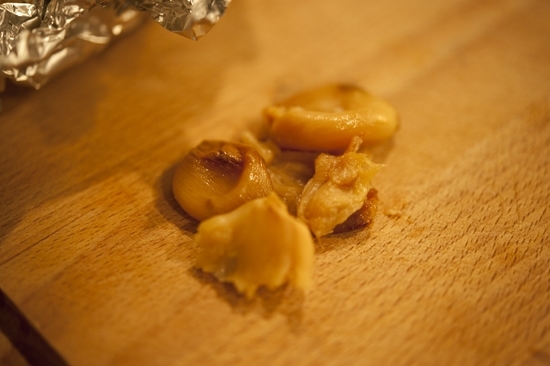 The roasted garlic! Which you can squeeze out of their magical skins. My favorite pastime. 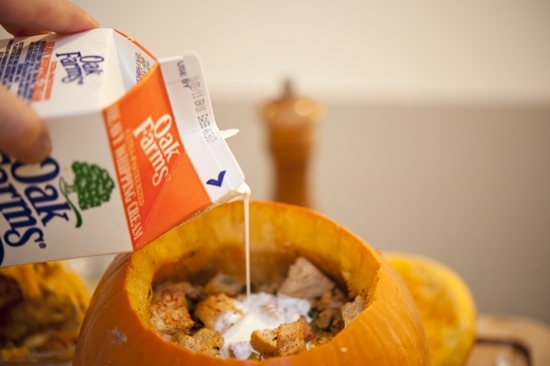 Scoop the stuffing into the pumpkin and fill it up. Then pour on some cream for moisture. Put the lid on top and bake this in the oven for about 90 minutes. 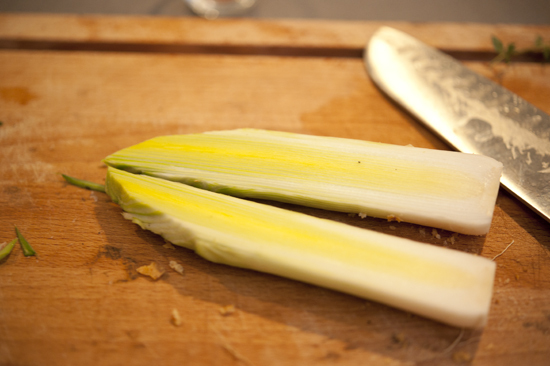 It will become very tender and easily pierced with a knife. That’s when it’s ready. This is festive to show to your guests at the dinner table, and bonus points if you can find very small pumpkins to serve these as individual servings. But they are just as nice cut up into wedges and served on a platter. 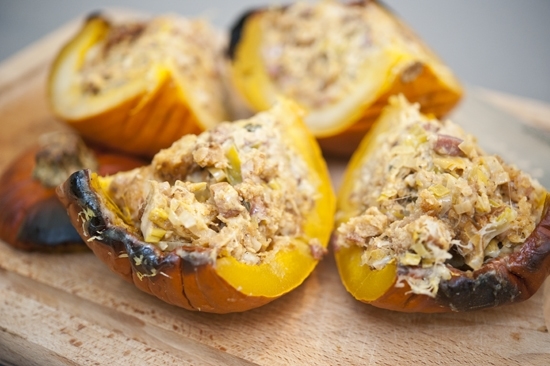 The filling is to die for and highlights pumpkin’s many virtues. 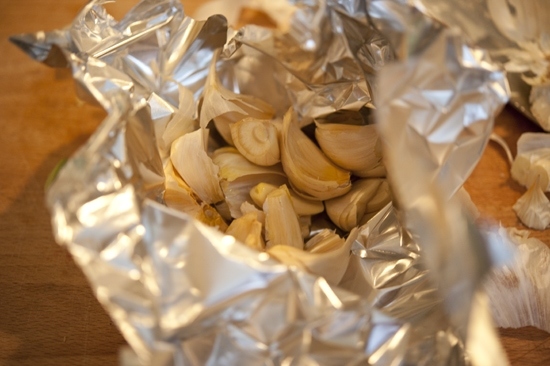 Cut the root and top end off of the garlic head, drizzle with olive oil, wrap in tin foil and roast in the pre-heated oven for about 1 hour, or until soft. 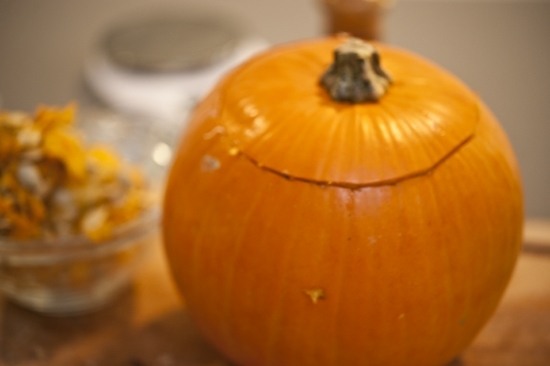 Cut a circle around the stem of the pumpkin and remove the lid. 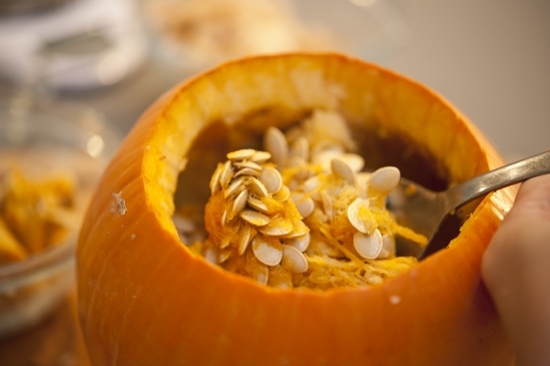 Cut the seeds off of the lid and scoop out the seeds from the inside of the pumpkin. Season the inside with salt and pepper. 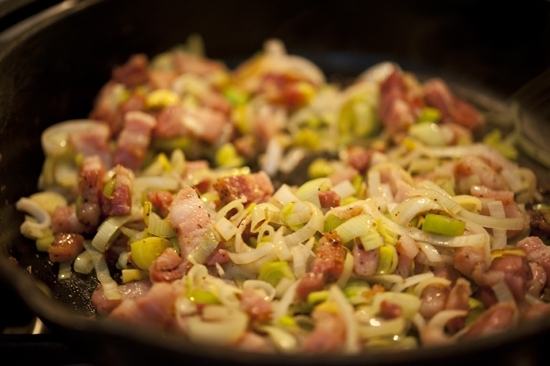 In a medium-large saute pan over medium heat, brown the pancetta to release the fat. 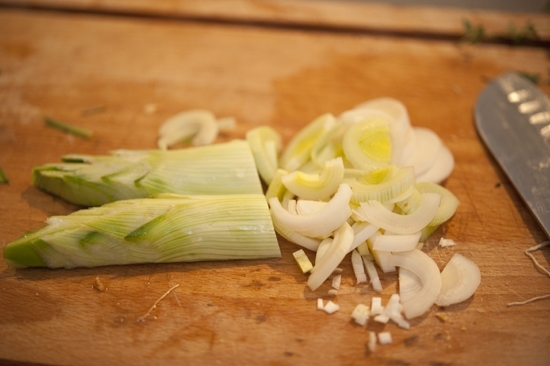 Add the leek and sweat until soft. Turn off the heat and let cool. 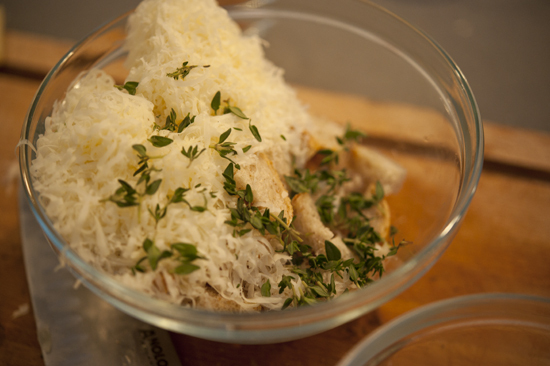 In a bowl, combine the croutons, cheese, thyme, nutmeg and smoked paprika. 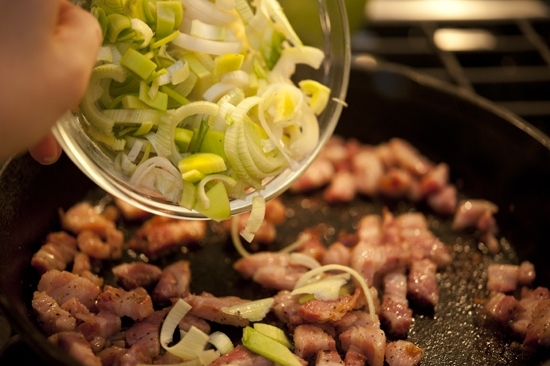 Once cooled, add the pancetta and leeks and mix to combine. 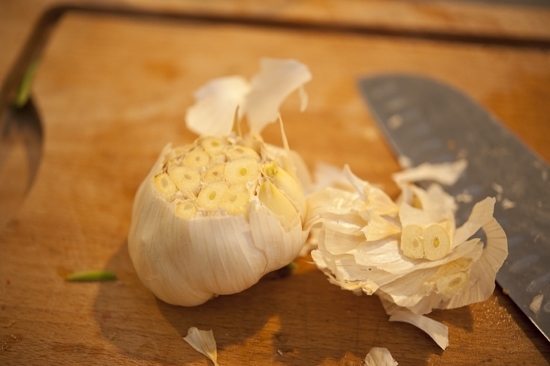 Remove the roasted garlic from the oven and squeeze the cloves out of the skins. Roughly chop and add to the mixture. 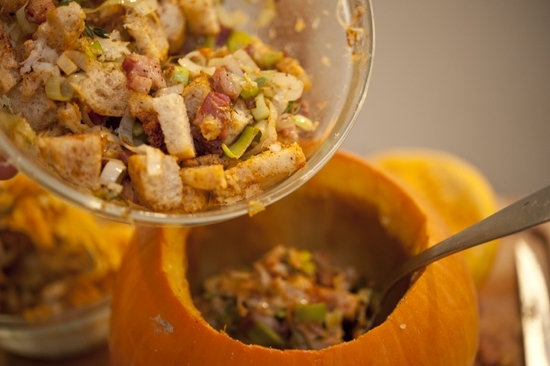 Fill the pumpkin with the stuffing mixture. Pour over the heavy cream, put the pumpkin lid back on, and place on a sheet tray covered with a rack or a silicone pad to prevent it from sticking. 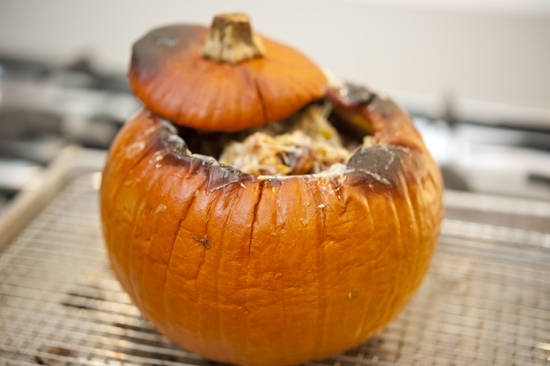 Bake for 90 minutes, or until the pumpkin flesh is tender and easily pierced with a fork. 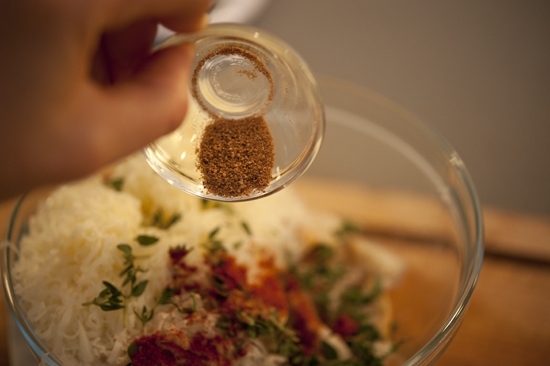 In the last 15 minutes of cooking, remove the lid from the pumpkin and top the stuffing with the extra grated gruyere. 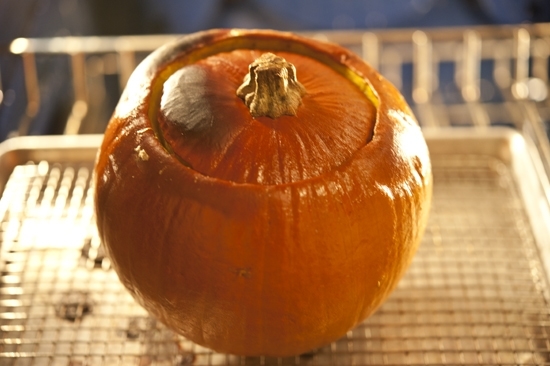 Return the pumpkin to the oven, keeping the lid on the side of the sheet tray so the cheese can brown and bubble. 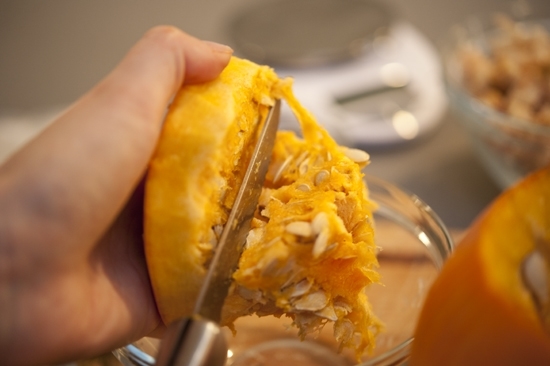 Serve warm, sliced into fourths, in half, or as individual pumpkins depending on their size. This is wonderful. I can already smell the delicious aromas wafting through the kitchen. 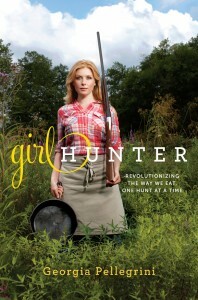 This also looks like it could be easily adapted for a variety of dietary choices (gluten-free, vegetarian, etc.). How creative!! 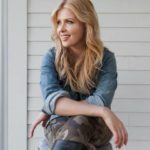 What a perfect fancy Fall recipe! 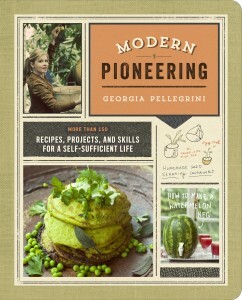 I am so excited to make this today ! 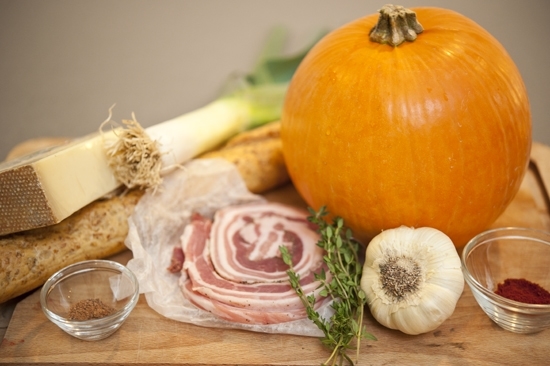 I will let you know how it turns out, I have a 5 pound pumpkin so I guess I just make a bit more stuffing and bake it a little longer, I hope I find the pancetta at the store, if not I will be using bacon. Thanks for the inspiration ! Just served this as a side with our venison steaks. Wow! My 12 year old gave me a high five, the 10 year old asked for thirds and my husband couldn’t stop making those “yummy” sounds with each bite. I have added this to our Family Favorites file. I did modify the bread by using a Gluten Free-Wheat free brand and no one could tell. Definitely a keeper! This sounds amazing! I cannot wait to try it. 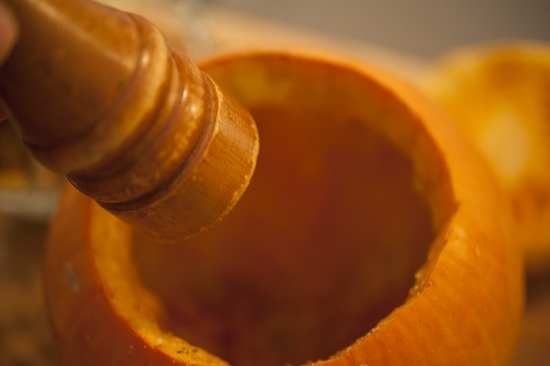 We are a family of pumpkin lovers so I am sure this will be a hit with all of us. My question is, what can this be served with? Would this be a main or a side dish? 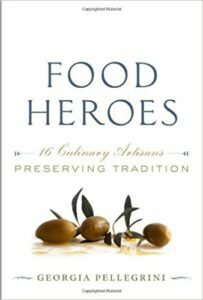 Thanks for your recipes and your help! It is filling enough as a main dish. It also goes nicely with roasted chicken or turkey on the side! And some leafy greens. Yum! I made something similiar the other night, and it was delicious! I’ve been making this every autumn for several years now, it’s become an Autumn Family tradition! This year, I happened to have lemon thyme Already So I used it instead of regular tHyme, and the results were awesome! 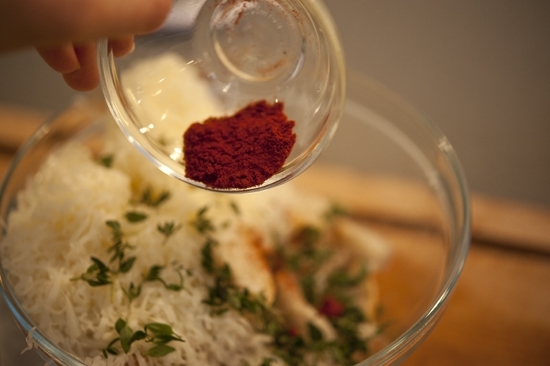 I’m making this a permenant change to the recipe! 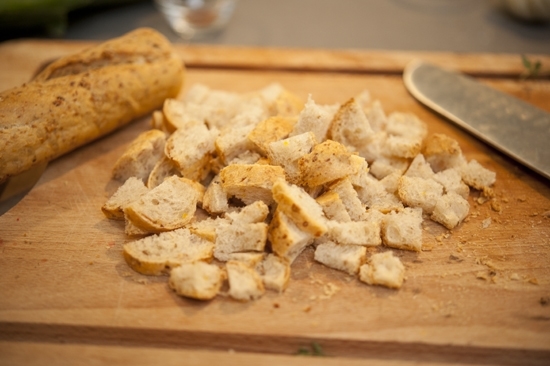 I’ve also found that croutons taste And work much better than just bread. How wonderful! Thanks for sharing your updates with us Anah! Always so happy to hear when my recipes become a family staple 🙂 Happy Autumn! !